5.94 points at 17 votes (rank 650). You either play alone with Mario or in twos with Luigi, Mario's brother, joining in. In the game, you need to knock over all enemies by jumping against the platform on which they move from below and then collect them. In the first level these are turtles, later crabs, flies and freezers. If you do not collect the knocked over enemies fast enough, they turn around again and get faster. Then also their colour changes to white. For each collected enemy there are points. Additionally you can try to collect coins. Below there is also the POW switch. By jumping against it all enemies that are currently on the ground can be knocked over at once. But keep in mind that you can only use it three times. In irregular intervals, there are bonus levels in which you have to collect coins within a limited time span. After a bonus level, the POW switch is regenerated. All levels have the same level design. Only the graphics of the platforms change. At the top the scores of Mario and Luigi are shown. In between you see the current top score. The small heads below the scores show the lives that are still left. Far below the current level is shown. There are simple sound effects and short melodies. Many animated sprites bring movement into the game. There is no end in this game, the enemies only get more and faster. Unfortunately, there is no highscore list. You can use the POW switch three times. In the next bonus phase but one, the POW symbol is completed again. If you jump with the head against the POW symbol a blast wave is triggered on all platforms. When having reached 30.000 points there is a non-recurring extra life. Every 10 level there is an intermediate screen. Higher combination points are possible, if several knocked over enemies are collected shortly after each other. A knocked over enemy should be collected straight away, because it will turn over again by itself! For each collected enemy, a coin comes out of one the upper pipes. Touch the coin before it reaches one of the lower pipes. 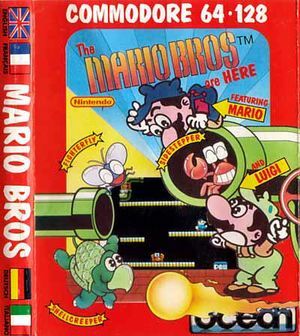 H.T.W: "Mario Bros the second and actually totally unnecessary to release a remake of the very good conversion by Atari, because neither graphics were improved nor was a highscore list built in. Additionally the controls got worse by the slithering when braking, which was not there in the original machine. 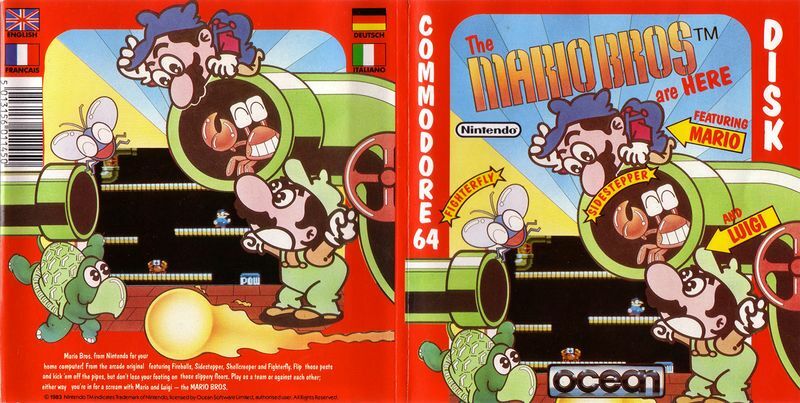 It is quite fun in the two player mode, but as single player this version of Mario Bros cannot score with me." Robotron2084: "Seen merely technically, I like this version better than the one by Atari, the graphics are clearer and the sprites do not flicker that much. Also the sound is much livelier. Unfortunately, the diffculty grade was raised to an absurd level by the utterly awkward controls, so that the actual challange in the game is to be able to manage with the inertness of the character figure. One can only shake one's head about what the programmers thoughts were here. A pity, because otherwise this would have been a great game, but as it is, there is more frustration than fun here. 6 out of 10 points." TheRyk: "What a fail. Ocean really succeeded in maximizing the annoying 'braking' effect of the Atari-Version controls. In addition with the higher tempo and the unclear visualization of the crabs' status, this version is no fun at all. 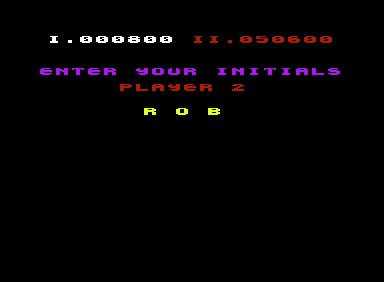 Approaches like changes in music and graphics and the highscore list don't really justify this version either. This unlovingly enhanced beyond playbility version is one of the most superfluous productions ever which I rate 2 points." Flexman: "Basically, I like this version better than the one by Atari, because it is more nicely animated and not as slow. 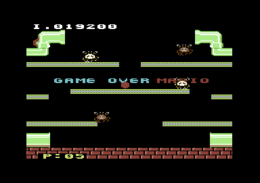 However, the controls of the characters have stayed as bad and the difficulty grade rises sky high when the flies appear. If you get them or not is only a matter of luck. Furthermore, as already mentioned, the characters are not really drawn badly, but also not very clearly recognizable." 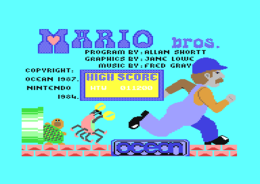 In 1984 there was a version by Atari for the C64, see Mario Bros (Atari). Mario Bros. in the Killer List Of Videogames.